NEIGRIHMS Recruitment 2018 2019 Application Form for 12 Junior Accounts Officer, Office Superintendent, Radiology, Technical Assistant (OT/ICU), Technical Assistant (Laboratory), Technical Assistant (OT/ICU) Posts Download Application through Official website www.neigrihms.gov.in. NEIGRIHMS Junior Assistant, Office Superintendent Jobs Notification 2018 Released. 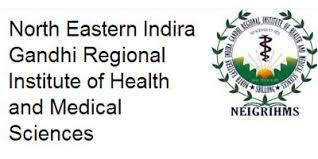 NEIGRIHMS invites Walk in Interview for appointment in following Junior Assistant, Office Superintendent post in North Eastern Indira Gandhi Regional Institute of Health & Medical Sciences. Candidates are requested to Download Application through Official website www.neigrihms.gov.in. Prospective candidates will have to before Walk in Interview carefully reading the advertisement regarding the process of examinations and interview, eligibility criteria, Offline registration processes, payment of prescribed application fee/intimation charges, NEIGRIHMS pattern of examination, NEIGRIHMS Syllabus, NEIGRIHMS Question Paper, NEIGRIHMS Walk in Date, NEIGRIHMS Result Date etc. 1. Junior Accounts Officer - Postgraduate Preferably in Commerce from a recognized University. 2. Office Superintendent - Bachelor’s Degree or equivalent from a recognized University. 3. Radiology - B.Sc (horns) in Radiology/ Medical Technology (X-Ray) from a recognized University. 4. Technical Assistant (OT/ICU) - B.Sc/ 12th/ 10th/ BMLT in OT technology from a recognized University or 12th with Science from a recognized Board/ University with Diploma in Medical Cardic. 5. Technical Assistant (Laboratory) - B.Sc/ 12th/ 10th/ BMLT in OT technology from a recognized University or 12th with Science from a recognized Board/ University with Diploma in Medical Cardic. 7. Junior Engineer - Bachelor Degree in Civil Engineer from a recognized University or Institute.